This is a Beautiful Original Artist Created Hand Calligraphy and Watercolor Painting of Classic Winnie the Pooh in an Ornate and Elegant Frame. As a Calligrapher and Illustrator for over 25 years I'm placing some of my original art pieces for auction here before exporting them to my online store. 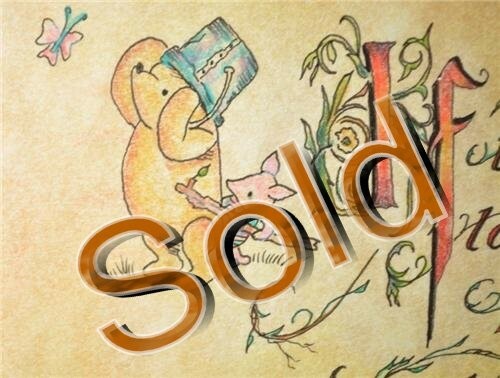 This Winnie the Pooh Calligraphy & Watercolor Painting is entirely hand created and professionally framed by me. Both the letterings and the Pooh illustration were delicately and intricately hand created by me using medias of watercolor, pastel chalk, and pen and permanent india black inks. The frame is all wood and quite ornate. "If the person you are talking to doesn't appear to be listening.....be patient. It may simply be that he has a piece of fluff in his ear." at an awesome purchase price! IMPORTANT SHIPPING NOTE: This item will ship USPS Parcel Post to save on your shipping costs.